Dimensions: 6 x .7 x 9 in. Joe Wilson (1938-2015), a native of rural East Tennessee, was a civil rights activist, self-educated scholar, founder/administrator of nationally important roots music enterprises, and was legendary for his colorful writing and opinions. 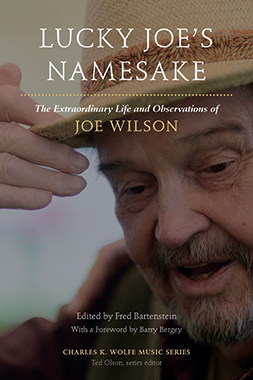 Lucky Joe’s Namesake, a companion to Roots Music in America: Collected Writings of Joe Wilson (also published by the University of Tennessee Press), brings us Wilson’s life and observations, mostly in his own words. From humble mountain beginnings, Wilson’s career progressed through Nashville, Tennessee; Birmingham, Alabama; and New York City, before settling him for twenty-eight years near the seats of power in Washington, D.C. as the executive director of the National Council for the Traditional Arts. In that role, he developed a national model for folk festival presentations, stalked the halls of federal representatives seeking support for traditional artists, and filled concert venues throughout the world with audiences eager to experience the work of master folk musicians. A powerful advocate on behalf of agrarian values, social justice, artistic authenticity, and cultural democracy, Joe wrote in an engaging, humorous, and memorable style. This eclectic anthology is filled with Joe Wilson’s brilliant published writing for magazines, books, and newspapers as well as privately circulated unpublished works, including an extended autobiographical essay. Readers are sure to benefit from Wilson’s lessons and artful ruminations culled from a lifetime of devotion to music and cultural and social activism.